Those buttons, located down by your right leg, are the visible front to an achingly long list of in-car technology. A brief look reveals the usual dynamic stability control, as well as switchable throttle maps, electronically adjustable active dampers and regenerative braking. That you notice none of this once you put the owner's manual away speaks volumes for the fundamental right-ness of the design, none of it interfering as I use the throttle to play with the BMW's backend entering and leaving the mountain bends. Earlier that morning, swamped in Manhattan's gray sea of traffic on my way out of town, there was little to hint at the M3's performance to come. The light clutch and adjusted-for-speed steering make easy work of the stop and go, while the suspension — firm in any setting — never makes the bumps go away, the jolts fail to affect the stiff body. The engine, while fast and flexible, doesn't hint at the performance its capable of. In fact, the whole thing feels decidedly normal. Looks it too, the bulges and droops making the already unappealing current 3-series even uglier. I like to think of the sedan's body as a form of camouflage; helping drivers avoid the attention a car this capable would normally garner. Even with the badges, those sitting one car over in traffic think of you as an upwardly mobile young executive from New Jersey, not someone hell bent on breaking every traffic law ever written. But it's not city driving for which people will purchase the M3. It's the sheer involvement with which it rewards drivers. 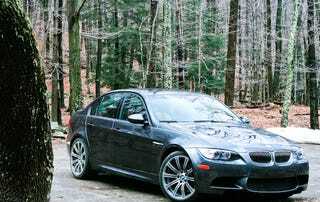 To look at it on paper, the BMW would seem a parallel for fast sedan rivals like the RS4, IS-F and C63 AMG. Gone is the lightweight simplicity of its forebears and present in the kind of complexity that'll make used car buyers shudder in three year's time. But, once you put your foot down, that piece of paper will disappear nearly as quickly as just about any other car on the road. It's just that good.